Oranges are actually a citrus fruit and are very popular because they are a remarkable source of vitamin C. They are usually consumed in their raw form or in the form of juice. Orange rind can also be used for numerous garnishing purposes and different recipes. Oranges are characteristic for their orange, textured skin. 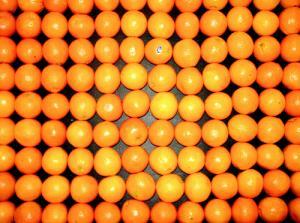 Orange is a hybrid of tangerine and pomelo. Tangerine is botanically referred to as citrus reticulate, while pomelo’s botanical name is citrus maxima. All different parts of the orange have an amazing nutritional value. Orange juice or fresh oranges are in important part of the breakfast for many people around the world. Oranges can be both sour and sweet and their edible parts contain up to 85 percent of water. Most calories contained in an orange come from the carbohydrates. Oranges are a remarkable source of vitamin C, potassium, dietary fiber, calcium, folate, vitamin A and vitamin B1. Oranges contain 170 different types of phytonutrients such as beta-carotene, vitamin B6, folic acid, magnesium, potassium and calcium. They also contains over 60 different types of flavonoids which are known for their powerful antioxidant, anti-tumor and anti-inflammatory properties. Oranges are also an excellent source of complex B vitamins, iron, magnesium, sodium, sulfur, copper, phosphorus and numerous other different types of essential minerals. The orange rind is also very rich in pectin. Oranges should always be kept in the refrigerator because when they get exposed to air the amount of vitamin C contained in them gets significantly decreased. An average orange which weighs 130 grams contains 70 milligrams of vitamin C, 0.65 milligrams of selenium, 269 IU of vitamin A, 13 milligrams of magnesium, 0.11 milligrams of vitamin B1, 18 milligrams of phosphorus, 39.7 milligrams of folate, 52.4 milligrams of calcium, 0.33 milligrams of pantothenic acid and 237.11 milligrams of potassium. Other important ingredients of oranges include copper, manganese, fats, sulfur, dietary fiber, sodium, proteins and iron. Each orange also contains 0.2 grams of fat, 15.4 grams of carbohydrates, 1 gram of protein, and 3 grams of precious dietary fiber. All different types of fruit derive their amount of calories from the natural sugars they contain. Oranges are particularly low in calories because they contain 85 percent of water. A medium sized orange has approximately 70 calories while freshly squeezed unsweetened orange juice has approximately 100 calories. They protect from the free radicals and the damage they cause, promote the health of the heart, support the immune system, maintain a steady balance of electrolytes, lower the levels of bad cholesterol in the blood and maintain the health of bones.